The Worst of the Worst, Sharon Eliza Nichols, St. Martin’s Griffin. 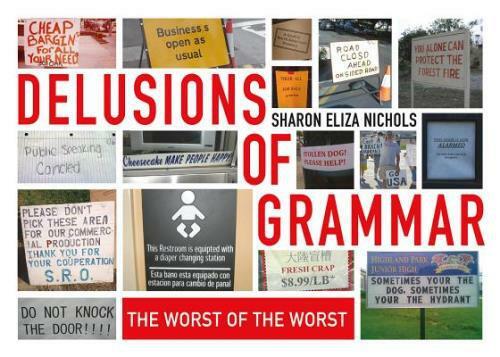 “I’m not alone in my contempt of the misuse of the English language,” writes Sharon Eliza Nichols in the preface of her latest book, referring to the tens of thousands of members of her “I Judge You When You Use Poor Grammar” Facebook page. Over the years the group’s so-called grammar groupies have shared more than seven thousand pictures that feature outrageous grammatical, spelling, and usage mistakes. This book—the follow-up to two previous volumes, including 2009’s I Judge You When You Use Poor Grammar—highlights the worst of the worst of those mistakes and contains upwards of 350 laugh-out-loud funny pictures (plus accompanying commentary), some of which would fit quite nicely in Bethany Keeley’s Book of “Unnecessary” Quotation Marks. Among my favorite pictures in the book: the photo of the Southern Beastro (It’s the Southern take on the French Bistro), and the sign which claims that “You Alone Can Protect the Forest Fire.” Naturally, “Delusions of Grammar” would not be complete without the inclusion of the infamous “Get a Brain! Morans” photo (2003), which would go on to become an Internet sensation. Most of the individuals responsible for the signs that appear in the book probably aren’t happy about the spotlight on their handiwork. But at least one organization has a sense of humor about its spelling mistakes. The LaConner Fire Dept. responded with the following message on the sign outside its firehouse: Thnx For Teling Us Abot R Spelun Miztakes Now We No Sumone Is Readin R Sine. On the Run—Fugitive Life in an American City, Alice Goffman, University of Chicago Press (2014) and Picador (April 2015). Demoted Planet—The Pluto Files: The Rise and Fall of America’s Favorite Planet. Leningrad—State of Siege, Michael Jones, Basic Books. Slow Getting Up—A Story of NFL Survival from the Bottom of the Pile, Nate Jackson, Harper.